The Emigrants (Swedish: Utvandrarna) is a 1971 Swedish film directed by Jan Troell and starring Max von Sydow, Liv Ullmann, Eddie Axberg and Allan Edwall. It tells the story of a Swedish group who emigrate from Småland, Sweden to Minnesota, United States in the 19th century. The film follows the hardship of the group in Sweden and on the trip. The film is based on the first two novels of The Emigrants series by Vilhelm Moberg, namely The Emigrants and Unto a Good Land. It was adapted for the screen by Bengt Forslund and Troell. The Emigrants won international acclaim, and was nominated for Academy Award for Best Foreign Language Film in 1971. It was nominated for four more Oscars the following year, including for Best Picture. It is followed by a 1972 sequel, The New Land (Nybyggarna), with the same cast. The 1974 U.S. television series The New Land is based loosely on both The Emigrants and its sequel. In 1844 in the Swedish province of Smaland, the Nilsson family lives in Ljuder Parish a small farm in the woods at Korpamoen. The eldest son, Karl Oskar, inherits the farm from his father Nils, after meeting a young girl named Kristina Johansdotter, who becomes his bride. She moves to Korpamoen to live with him and his parents. In the following years, Karl Oskar and Kristina start a family, starting with a daughter, Anna, followed by Johan, Marta and Harald. The family struggles with poor weather and harvests and hunger. Karl Oskar's rebellious younger brother Robert first comes across the idea of emigrating to America, tired of being treated poorly as a farmhand. He first asks his friend Arvid, another farmhand at Nybacken to come along with him, who eagerly agrees to do so, but the pair's hopes are dashed when they realize they do not have the money needed for their passage. Robert confronts Karl Oskar about selling his share of the farm in order to afford the passage, only to find out that Karl Oskar himself had been considering the idea of moving his family to the United States. Despite the offerings of a better life, Kristina adamantly rejects the notion, not wanting to leave her homeland as well as being fearful of risking the lives of their four young children on the ocean. However, the family loses Anna to hunger. Devastated by this loss, Kristina agrees to Karl Oskar's plan to emigrate to the United States, and they begin making preparations for the journey. Meanwhile, Kristina's uncle Danjel Andreasson comes into conflict with the parish clergy for preaching in his home the teachings of the Akian sect to which he belongs. This leads to him, his wife Inga Lena, and their four young children being exiled from Sweden. After this, Danjel arrives at Korpamoen to join the emigration party. Danjel also plans to bring two of his followers to America as well, Ulrika of Vastergohl, a former prostitute, and her sixteen-year-old daughter Elin. Robert persuades Danjel to hire Arvid and pay his fare to America. Not long afterwards, a friend and neighbor of Karl Oskar, Ulas Petterson, also expresses an interest of going with them to North America as an escape from his unhappy marriage. The night before their departure, Kristina reveals to Karl Oskar that she is expecting another child. The party travels south from Korpamoen to the port city of Karlshamn, where they board the wooden brig Charlotta, which is bound for New York City. Onboard, Karl Oskar and Kristina meet Mans and Fina Kajsa Andersson, an elderly couple heading for the Minnesota Territory, where they plan to settle on their son's farm near a town called Taylor's Falls. After hearing how good the land is there, Karl Oskar and Kristina decide to follow them to Minnesota. During the voyage, Inga Lena and Mans Andersson die of sudden illnesses, which nearly claims Kristina as well. Upon their arrival in New York, Karl Oskar and his party along with Fina Kajsa begin the long journey westward to Minnesota, first by train, then by riverboat. During the journey from Sweden, Karl Oskar and Kristina have had difficulties dealing with Ulrika, but they quickly reconcile during a stop during the journey on the riverboat when one of Karl Oskar and Kristina's children becomes lost, only to be found by Ulrika. Not long afterwards, tragedy strikes the party again when Danjel's infant daughter dies after a brief illness. The party finally arrives at the town of Stillwater and with the help of a friendly Baptist minister they are able to find their way to the widow's son's farm in what is now known as the Chisago Lakes area. After Danjel and Ulas Petterson make their claims to fine tracts of farmland, Karl Oskar heads deep into the woods to explore the lands along the shore of lake Ki Chi Saga, now known as Chisago Lake. Upon his arrival, he finds the topsoil to be of excellent quality and makes a claim to the land for himself and Kristina and their family by carving his initials into a tree overlooking the lake. Plans for adapting The Emigrants novels began late in 1967. Its author, Vilhelm Moberg, had seen Jan Troell's film Here Is Your Life before producer Bengt Forslund approached him about an Emigrants film. SF Studios wished to adapt all four novels, although it was uncertain how such a film structure would work. Moberg requested Forslund and Troell meet him, and the three men mapped out a plot, with 98 scenes, finishing in March 1968. They also envisioned Max von Sydow, Liv Ullmann and Eddie Axberg as the ideal stars. Troell and Forslund went location scouting in the United States in September 1968, but found many of the lands were too developed or could not accommodate film equipment. The scenes set in Chisago Lakes were actually filmed at Lake Krageholm in Scania, Sweden. Filming took place from June 1969 to January 1970. More takes were filmed in May to August 1970. Ullmann said that for the two films, shot at the same time, the actors had to learn historic methods of laundry, and that the brief scene in The Emigrants where she is on a swing took two days to film. The film employed 20 actors and 500 extras. The combined cost of the two films was kr 7 million, then the most expensive Swedish film. The film was released to cinemas in Sweden on 8 March 1971. The film opened in New York City on 24 September 1972, distributed by Warner Bros. The U.S. version was cut from 190 to 150 minutes. In the U.S., the film was never released on home video until February 2016, when The Criterion Collection released it on Blu-ray with The New Land. The films were frequently requested by customers. The Emigrants was featured in the 2016 Gothenburg Film Festival. The film received mostly positive reviews. Roger Ebert gave it four stars, praising it as a "masterpiece," "infinitely absorbing and moving," and likely more accurate than traditional stories about immigration to the United States. Richard Schickel wrote in Life that "Jan Troell has made the masterpiece about the dream that shaped America - a dream, and an America, fast disappearing from our views." Vincent Canby of The New York Times hailed the acting performances, especially from von Sydow and Ullmann, which he found to hold "a kind of spontaneous truth, in look and gesture, that does a lot to relieve the otherwise programed nobility, truth and beauty." However, Canby criticized Troell for excessive views of "sunlight-reflected-in-water that becomes just one too many, a thing of movie decoration." In New York, Judith Crist praised the film as "exquisite," and that the depiction of history "throbs with flesh and blood." In 5001 Nights at the Movies, Pauline Kael declared the film is "A bursting, resonant work." In his 2015 Movie Guide, Leonard Maltin gave the film three stars, calling it "Solid if rambling." Dave Kehr recalled it as overrated, "Uncommitted, tedious, and often dishonest." In 2016, the Swedish journal Sydsvenskan recalled The Emigrants as a classic. The Emigrants was nominated for five Academy Awards, including for both Best Foreign Language Film and Best Picture. However, the Academy's rules for eligibility for specific awards meant the nominations occurred in two separate years. It was the third film not in English to be nominated for Best Picture in the history of the Academy. 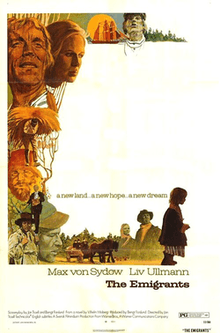 The sequel, The New Land (Nybyggarna), was released in 1972. The 1974 U.S. television series The New Land is based loosely on both The Emigrants and its sequel. The creation of the TV series can be attributed to the popularity of the films. In Sweden, the musical Kristina från Duvemåla by Björn Ulvaeus and Benny Andersson, formerly of ABBA fame, was designed partly in reaction to Troell's films, particularly in differences in the set. Troell also gave his approval to Daniel Espinosa to make a new Emigrants film adaptation in 2015. The two films were considered to give Jan Troell his "international breakthrough." The films led to his accepting an offer from Warner Bros. to make Zandy's Bride, one of the first times a prominent Swedish director moved to Hollywood since the 1920s. 1 2 Nils Y. Wessell, ed., The American-Swedish '72, American Swedish Historical Foundation, 1972, p. 15. 1 2 3 Wessell, ed., p. 16. ↑ Liv Ullmann, Liv Ullmann: Interviews, University Press of Mississippi, 2006, p. 6. ↑ "Utvandrarna" (in Swedish). Swedish Film Database. 8 March 1971. Retrieved 21 September 2016. 1 2 Canby, Vincent (25 September 1972). "'The Emigrants,' a Swedish Film Epic, Lands Here". The New York Times. Retrieved 27 November 2016. 1 2 Pauline Kael, 5001 Nights at the Movies, Henry Holt and Company, 2011, p. 216. ↑ Sharf, Zack (17 November 2015). "'The Graduate,' 'The Kid' and More Classics Hitting Criterion Collection in February". IndieWire. Retrieved 27 November 2016. 1 2 Mälarstedt, Kurt (30 January 2016). "Människan i en monter. Jan Troell gjorde film av 4300 år gamla utvandrare.". Sydsvenskan. Retrieved 28 November 2016. ↑ Kate Roberts, Minnesota 150: The People, Places, and Things that Shape Our State, Minnesota Historical Society Press, 2007, p. 125. ↑ Ebert, Roger (15 January 1973). "The Emigrants". Rogerebert.com. Retrieved 27 November 2016. ↑ Schickel, Richard (1972). "When America was a dream". Life (October 13): 28. Retrieved 2010-01-21. ↑ Judith Crist, "Compassionate Epic," New York, 25 September 1972, p. 86. ↑ Crist, "Compassionate Epic," p. 87. ↑ Leonard Maltin, Leonard Maltin's 2015 Movie Guide, Signet, September 2014. ↑ Kehr, Dave. "The Emigrants". Chicago Reader. Retrieved 27 November 2016. ↑ D'Angelo, Mike (6 February 2016). "Jan Troell's The Emigrants and The New Land work best as one very long movie". The A.V. Club. Retrieved 28 November 2016. ↑ Benson, Raymond (3 February 2016). "'THE EMIGRANTS' / 'THE NEW LAND' (1971/1972; Jan Troell) Starring Max Von Sydow and Liv Ullmann (The Criterion Collection)". Cinema Retro. Retrieved 28 November 2016. ↑ "The 44th Academy Awards (1972) Nominees and Winners". Academy of Motion Picture Arts and Sciences. Retrieved 2011-11-27. ↑ "THE 45TH ACADEMY AWARDS Winners & Nominees". Academy of Motion Picture Arts and Sciences. Retrieved 28 November 2016. ↑ "The Emigrants". Golden Globe Awards. Retrieved 28 November 2016. ↑ "Utvandrarna (1971)". Swedish Film Institute. 2 March 2014. ↑ "1972 Award Winners". National Board of Review. Retrieved 28 November 2016. ↑ Judith Crist, "To Set the Tube Aglow," New York, 28 January 1974, p. 59. ↑ Brooks, Tim, and Earle Marsh, The Complete Directory to Prime-Time Network and Cable TV Shows, 1946-Present, Sixth Edition, New York: Ballantine Books, 1995, ISBN 0-345-39736-3, p. 738. ↑ Rafferty, Terrence (9 February 2016). "The Emigrants/The New Land: Homelands". The Criterion Collection. Retrieved 27 November 2016. 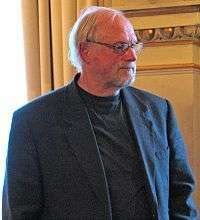 ↑ Nyström, Martin (27 October 2014). "Göteborgsoperan: 'Kristina från Duvemåla'". Dagens Nyheter. Retrieved 28 November 2016. ↑ Lindblad, Helena (16 May 2015). "Svenska storfilmer presenterades i Cannes". Dagens Nyheter. Retrieved 28 November 2016. 1 2 Arne Lunde, "Going Hollywood: Nordic Directors in American Cinema," Nordic Genre Film, Edinburgh University Press, 2015, p. 232.